Are you looking for a powerful WooCommerce WordPress theme to set up your online store ? 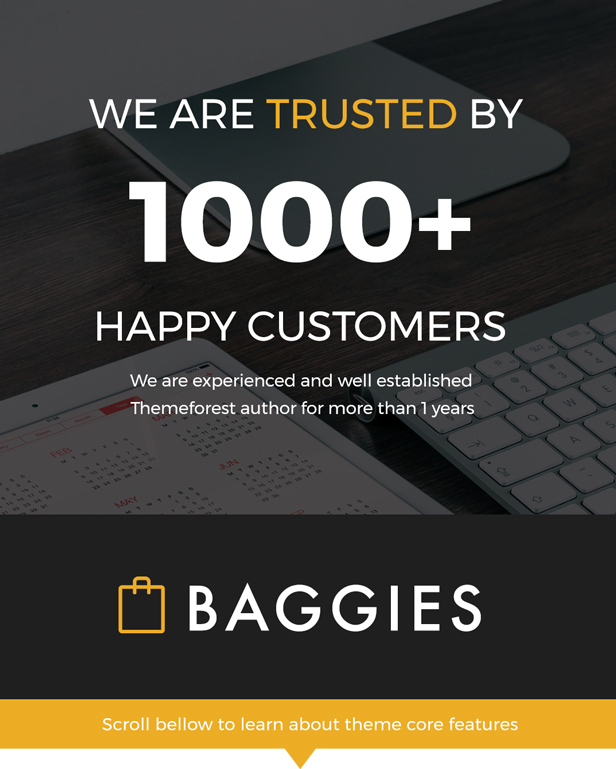 Baggies, a stunning, fully customizable web solution designed to take your online store, marketplace, portfolio, or blog to the next level. You can choose from 7 predefined homepage layouts, 5 predefined portfolio layouts and many more. or build your own using Visual Composer, a powerful drag-and-drop page builder that enables you to build custom web pages from scratch in a matter of minutes, without having to write a single line of code. - Fix responsive issue in checkout page. - Fix Quick view issue in mobile devices. - Fix single product double quantity label. - Add filters for sidebar toggle icon. so user can change it from child theme. - Fix dokan dashboard page issue. - Fix top menu issue.